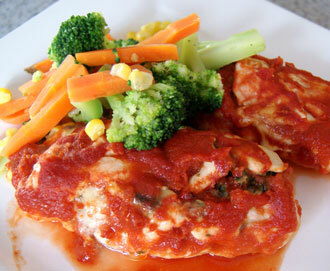 These stuffed chicken breasts are easy and delicious. Filled with melted cheese mixed with mushrooms and spinach then topped with a rich tomato sauce, the combination proves to be an absolute winner. I use a tasty cheese such as Swiss or Jarlsberg to give the dish oomph. You could also use a tomato based pasta sauce for added flavor. 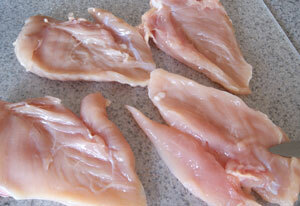 Lay the chicken breasts out flat. To flatten them further place between two layers of waxed or greaseproof paper and pound with a kitchen mallet. You need to be fairly firm without breaking or tearing the chicken. Pound from the center outwards. Top each chicken piece with spinach. You can use fresh spinach leaves or frozen spinach. If using frozen spinach defrost first in the microwave, then squeeze out the excess liquid. 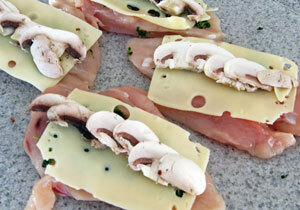 Place a piece of tasty cheese over the top, such as Swiss or Jarlsberg. Then top with sliced mushrooms. Now take one end of chicken and carefully roll it over, being careful not to break the chicken and keeping the filling within the chicken. Secure the sides with toothpicks. Heat a small amount of oil in a non-stick frypan and fry the chicken pieces over a medium-high heat until they are golden brown on both sides. 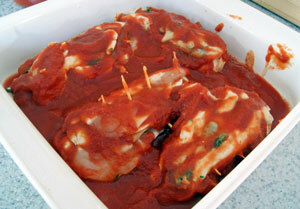 Transfer to a shallow oven-proof dish and pour over the Passata sauce. Bake uncovered in the oven for about 15 – 20 minutes, or until the chicken is fully cooked through. When cooked transfer to a serving plate and remove the toothpicks.